But sometimes, the provenance of documents, especially documents that were acquired nearly 60 years ago, before the time of electronic databases and searchable e-mail correspondence, is not as robust as one would hope. Such is the case for the provenance of the John Greenleaf Whittier Papers. Over the summer, Marian Matyn, Archivist at the Clarke Historical Library, was interviewed by Sarah Adams of WCMU, the Public Radio affiliate from Central Michigan University about the history of the Skerbeck Carnival. Matyn provided some interesting information about the history of the Skerbeck Carnival, which was one of the many attractions featured during the 4th of July Bay City Fireworks festival, and provided great entertainment during the holiday weekend. Matyn told of the history of the largest family-owned-and-operated carnival in Michigan and the part they played at the 1893 World’s Fair in Chicago, where they really discovered what would “wow” the crowds. To read the WCMU news release about Matyn’s interview and the Skerbeck Carnival, please follow this link. And if you are interested in the history of Great Lakes circuses and carnivals, contact the Clarke Historical Library with any questions. Today, we learned of the death of one of Michigan's most notable authors, Elmore Leonard, who passed away earlier this morning at the age of 87. 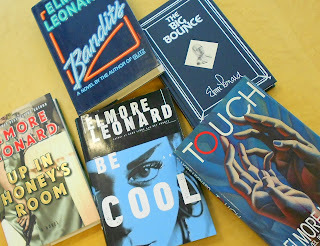 Remembrances for the author of notable crime novels such as Get Shorty, Out of Sight, and Rum Punch - which was adapted for the film Jackie Brown - have appeared throughout media, including obituaries the Detroit Free Press and the New York Times. 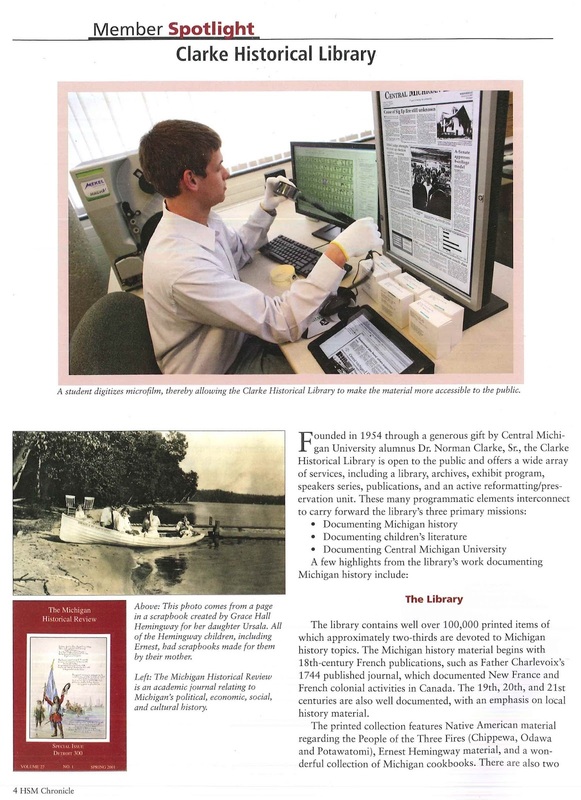 The Clarke Historical Library was featured in the Member Spotlight section of the Summer 2013 Chronicle - a quarterly publication of the Historical Society of Michigan (HSM). 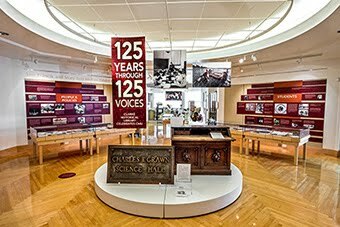 The write-up includes information about the history of the Clarke, our collections, our exhibits and lecture series, and the services we provide. We appreciate the support of the Historical Society of Michigan and the opportunity to be featured in their publication. In addition to information about the Clarke, the Summer 2013 Chronicle includes news from the Historical Society, details about upcoming events, and articles concerning the history of taxing churches in Michigan, southwest Michigan's role in the Underground Railroad, the Battle of Lake Erie, Minoru Yamasaki - a pioneering architect in Michigan, and Michigan's telegraphy pioneers. Chronicle is a benefit of membership in the HSM. You can find more information about subscribing to this magazine, the other publications of the HSM and becoming a member of the Historical Society of Michigan via this link. On July 31, Michael Artman charmed an attentive audience with his presentation about “Hemingway’s Paris.” In 1997 Artman and his wife, Anita, made possible a vacation in France by exchanging their home in Port Huron with a French family, who in turn gave to the Artmans the keys to an apartment on Paris’ Left Bank. The Artmans soon realized that their new Paris “home” was only a few blocks away from the apartment Ernest and Hadley Hemingway had occupied when they lived in Paris during the 1920s. The Road to Andersonville: Michigan Native American Sharpshooters in the Civil War, a documentary produced by David Schock and premiered at a Clarke Historical Library event in April, will be shown on WCMU - the PBS affiliate from Central Michigan University - this Sunday, August 4 at 4:00 pm. If you were unable to attend the premier of the documentary or would like to watch the film again, make plans (or set your DVR) to see this story of the service of the 139 Native Americans in Company K, First Michigan Sharpshooters. This documentary was made possible, in part, by a grant from the Michigan Humanities Council.